On Friday afternoon, March 21, funeral services for Mrs. Lizzie Hinck were held in the home of her son, Henry W. Hinck, near Emma junction at 2 o’clock. At 2:30 o’clock the services were continued in the Holy Cross Lutheran church. Rev. H. C. Harting delivered the sermon and E. H. Brockmann presided at the organ and directed a group of children in the singing of a hymn. Mrs. Hinck died last Wednesday. Mrs. Lizzie Hinck was born September 8, 1869 in Alma. She was the daughter of Charles Brace and Dora Borsom Brace. She was baptized by Rev. F. R. Rohlfing in Trinity Lutheran Church in Alma. On January 22, 1890, she was married to William Scholle. Two sons were born to this union. Benjamin Lewis died in infancy on June 9, 1893. The other son, George Scholle, died March 15, 1928. The father of these children, Wm. Scholle, died February 12, 1893. On August 24, 1893 the widowed Mrs. Scholle was married to John A. Hinck at Alma, Mo. Three sons and two daughters were born to this union, all of whom survive. They are Henry W. Hinck of Emma, Wm. F. Hinck of Sweet Springs, Otto A. Hinck of Concordia, Dora, Mrs. Lambert Heme [sic] of Sweet Springs, and Mary, Mrs. Adolph Eckhoff of Sweet Springs. Others [sic] survivors include 26 grandchildren, 7 great-grandchildren, three sisters, Miss Mattie Brace of Sweet Springs, Mrs. Emma Dorsey of Fargo, North Dakota and Mrs. Lulu Menegali of Sweet Springs and one brother, Wm. Catlander of Marshall. The deceased’s husband, John A. Hinck, died June 6, 1927. For a number of years Mrs. Hinck made her home in or near Emma. During the final months of her life, she lived with her son, Wm. F. Hinck, where she died at the age of 77 years, 6 months and 11 days. Grandsons who served as pallbearers were F. C. Dohrmann, Eldon G. Frerking, Herbert Hemme, Leonard and Willis Hinck, and Omar Oetting. Granddaughters who carried the flowers were Alleen Eckhoff, Geraldine Hemme and Mabel and Ruby Hinck. Interment was in Holy Cross cemetery. Transcribed by Debbie Kirchhoff and Brett Mueller, April 2006. 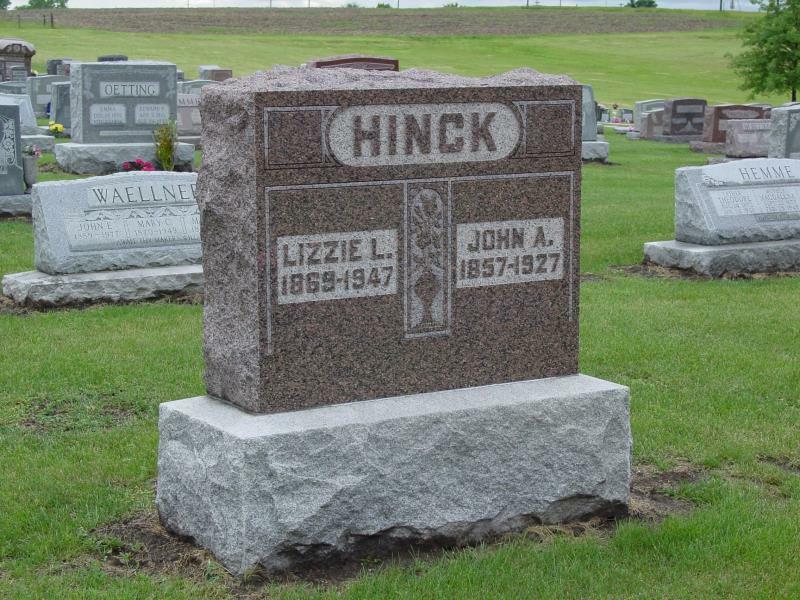 Lizzie L. Hinck was my g-g-grandmother.